Rahel Bluwstein is considered the “founding mother” of modern Hebrew poetry by women. Her dedication to Zionist ideals combined with her suffering from agonizing illness made her a symbol in the eyes of the Israeli public – and her mythic aura persists to this day. Bluwstein was born in Russia to a prominent Jewish family. Her father was a wealthy merchant who was known to be very generous, and her mother was an educated woman who descended from a long line of rabbis. Rachel was also well-educated. Her parents provided private tutors for her general education in addition to her Hebrew learning. 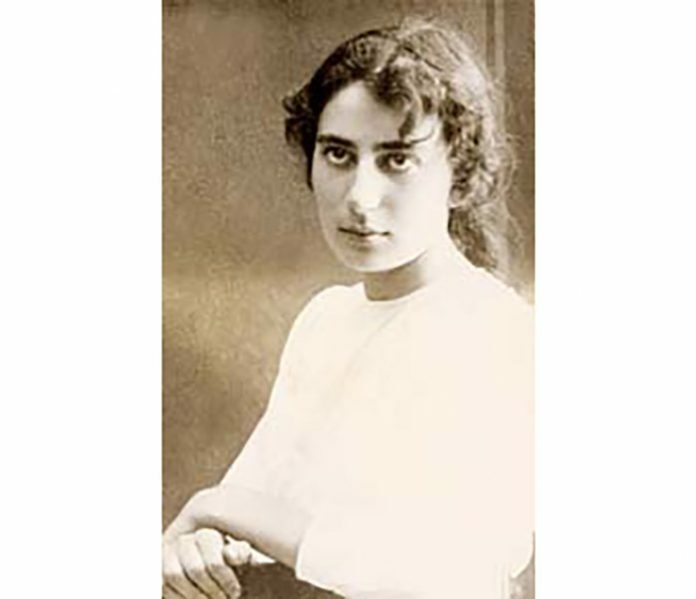 As a result, she began writing both Russian and Hebrew poetry at a young age. Young Rachel took her first trip to Eretz Yisrael, then Palestine, in 1909. While there, she met and was highly influenced by Hannah Maizel, a pioneer who had created an institution where young women could learn agricultural techniques. Rachel the poetess found inspiration in working the land; she fell in love with agronomy. The visit was short, and she returned a year later and committed herself to working with Maizel. Within this framework of commitment, Rachel helped found Kvutzat Kinneret and Kibbutz Degania. With Maizel’s encouragement, Rachel embarked on a professional career in agronomy at the University of Toulouse. Unfortunately, when her studies were completed, the outbreak of World War I prevented her from returning to Palestine. So she proceeded to Odessa instead where she committed to caring for refugee children, a commitment that had tragic, life-changing consequences for the kindhearted poetess – she contracted tuberculosis from her charges. While she did eventually return to her beloved Palestine, her remaining years were few and spent suffering in hospitals and sanatoria in different parts of the country. She wrote poetry for the rest of her life, the majority set in the pastoral countryside of Eretz Yisrael. She joined Kevuzat Deganyah and it was there that her first Hebrew poem, “Halokh Nefesh,” was published, in the prestigious Hebrew literary journal Ha-Shiloah. It was the first Hebrew poem written by a woman to be published in the journal. In fact, it was the first poem by a professed woman poet in modern Hebrew. In early April 1931, Rahel’s condition deteriorated and she asked to be taken to Tel Aviv to die. On April 15, she was transferred by horse-drawn carriage from Safed to Hadassah Hospital in Tel Aviv. One day later, on April 16, 1931, she died at the age of forty-one. In one of her poems, Rahel had expressed a desire to be buried in Kvutzat Kineret, and her friends treated this as a last will and testament.